Translated Sebastian Brock. 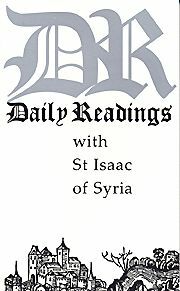 St. Isaac of Syria is acknowledged as one of the greatest spiritual writers in the Eastern Orthodox tradition. His combination of penetrating insight and deeply felt compassion has appealed to generations of readers in the past. Here are the words of one of the greatest spiritual writers of the 7th Century Church. St. Isaac’s simple but profound words are ideal for daily meditation, and throw fresh light on the spiritual path. Softbound. 94 pgs.